I’m a Kiwi with over 15 years experience in front-end development and accessibility. 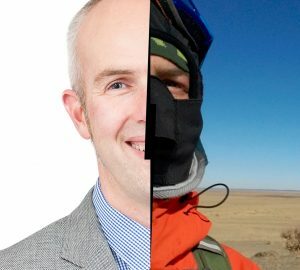 Me – in a suit, and in Mongolia. My official company avatar shows me smiling in a suit and tie, but I’m much more comfortable in my smelly cycling gear, roughing it while exploring the world’s great backyard. Ever curious, I’m an explorer and an idealist. As a front-end developer, I’m painfully aware of the ever expanding digital divide. As a long distance cycle tourist traveller, I have first-hand empathy for those less considered. In the world at large, I see a common thread of complacency, a focus on getting ahead and making money, at the cost of everything else. I feel disappointed in our generation. I dream of a world where the priorities are different, where people always come first. But change is slow, and few are willing to risk everything for the greater good. I’m not perfect by any means. I constantly struggle to consolidate different goals, and what I see as a double life. But I strive to keep it real, to embrace a traveller mentality, to take the roads less obvious, and above all to keep learning. To share my experiences and perspectives, I blog and run workshops. I advocate for change and I try to walk the talk. I’m always keen to meet other travellers on life’s journey. Please get in touch if you’d like to meet for a coffee or beer and share perspectives.